“Deadliest of the Species, Part 6” It all comes down to this: The new Black Panther versus Morlun — Devourer of Totems – in a fight to the finish. Cover-to-cover action, with the fate of Wakanda, T’Challa and Storm hanging in the balance. Shuri circles Morlun who at first dismisses her as a nuisance but soon realizes there’s more to her than meets the eye. She runs off and he gives chance abandoning T’challa in the process. 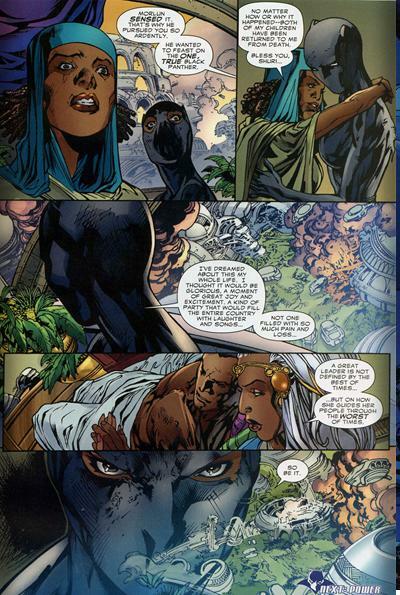 In Limbo T’challa is having a hard time accepting Storm’s proposal of leaving her their so that he can live. T’Challa decides there must be another way and decides to fight for both their lives. Shuri is in radio contact with Ramonda. She and Zawaviri have a plan and Shuri must get Morlun to their hut for it to work. Shuri get battered and injured by Morlun but does get him to the hut. Zawaviri uses his powers to send him to Limbo. Upon seeing him death sends T’challa and Storm back to the land of the living since Morlun smells of “ten thousand souls”. Back in reality Zawaviri reveals to Shuri that she has become the one true Black Panther with her selfless deeds and that’s why Morlun attacked her abandoned T’challa. Finally gaining the approval of her mother she prepares to lead Wakanda back from the brink of destruction, the likes of which they have never seen before. Cover- I really dig this cover, even more so than the last issue. 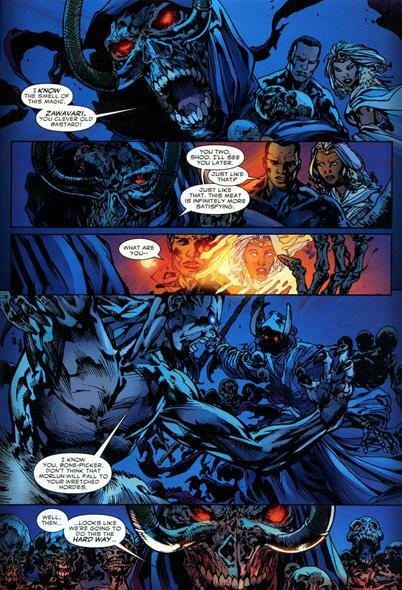 This one illustrates the battle between Morlun and Shuri with T’challa’s all but lifeless in the background. Art- The illustration and color courtesy of Ken Lashley and Paul Mounts respectively are still top notch and give the book a distinctive dynamic feel. They also give this book a very high profile and quality finish. Conclusion– The defeat of Morlun was a bit predictable but still satisfactory given the magnitude of the threat and the need to save both the king and queen’s life. 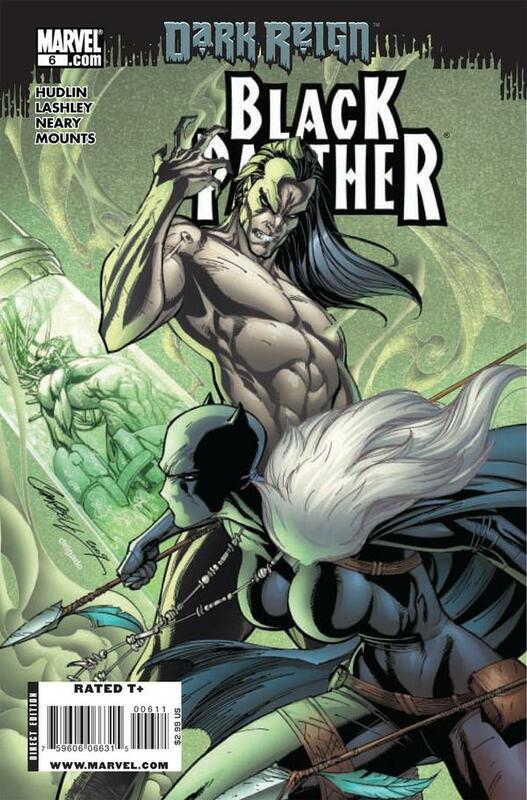 Shuri and the love of S&T were the main highlights along with the knowledge of the magician/voodoo priest Zawaviri. He is surprisingly insightful and perceptive despite being called a “nut”. The payment for this boon to the royals is touched on, clearly there must be something he wants after all these years living literally on the ‘fringes’ of the technologically advanced Wakanda. Reconcilliation– Shuri and Ramonda finally get the closure they need to the constant approval the latter has wanted. This issue also ties in directly into Hudlin’s opening arc “Who is the Black Panther?” from volume three where Shuri’s skill was shown before she was pinned down and thus prevented from assuming the panther mantle. It all comes full circle here with her dream finally realized but her nation at it’s lowest. The End-I’m not a fan of a clean and tidy resolution to conflicts like this it always makes the conflict which lead to them seem so hollow when the villain just gets defeated quick and neat. No one who died was noteworthy enough to make the Morlun situation memorable. Shuri and everyone else came off as dumb not figuring out what Zawaviri had to explain with Shuri becoming the black panther thus why Morlun abandoned T’challa and took chase of her.